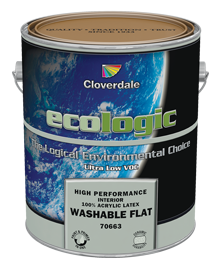 EcoLogic Washable Flat is a high performance, 100% Acrylic Latex Interior Waterborne finish formulated with latex resin and ceramic microsphere technologies that provide superior resistance to stains, burnishing and abrasion compared to other flat latexes. It is formulated to contain near zero VOC's, reducing its impact on the environment and meets the requirements of the leading reduced VOC standards across North America. It applies smoothly with excellent flow, levelling, hide and coverage providing a rich designer gloss-free finish.